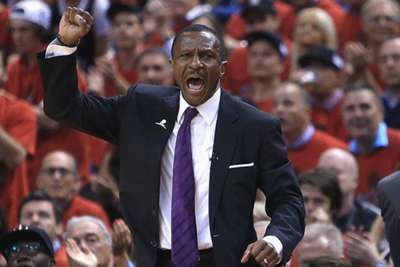 Dwane Casey is the Detroit Pistons' new coach, the team announced on Monday. Casey has reportedly agreed a five-year contract with the Pistons to replace Stan Van Gundy, who was fired last month. The move was made possible after Casey himself was fired by the Toronto Raptors after seven seasons, his side swept by the Cleveland Cavaliers in the Eastern Conference playoffs having been top seed for the first time. That meant the Raptors finished 59-23, which gave Casey a 320-238 record and made him the franchise's most successful coach. Casey also coached the Minnesota Timberwolves from 2005-07, where he amassed 53 wins and 69 losses. "Dwane is one of the most successful and highly respected coaches in our league," said Pistons owner Tom Gores. "He's a great communicator and a leader who will connect with our players and accelerate their growth. Having spent many hours with Dwane over the last few weeks, I'm confident he is the right person to get us to the next level. "In our meetings he displayed great insight into what this roster can accomplish, and great passion about our city and the team's role in bringing people together. He's an outstanding man with impressive character. He embodies our culture and will be a great representative for our franchise."